Basic specs is 128Mbit of SDRAM to handle (bigger than) the biggest games ever. Load games off a CF card, loading times in a few seconds. Optional DSP1 chip for Mario Kart. Works on NTSC, PAL, clones, Super Famicom, basically anything I have tested. Please tell me this will play the translate Star Ocean non S-DD1 hack. 128 Mbit of SDRAM... That's amazing! Did you have to use donors for the lockout and DSP1 chips? It must be expensive to keep supply of DSP1 donors, so I can definitely understand the extra charge. See, See, I'm not insane!! interesting, are any additional enhancement chips like the super fx chip for example planned and are they possible to implement? Since there is no mention of it and the real DSP1 is installed manually I assume not, but I thought i would ask. btw u thinkin about any N64 carts by chance? Last edited by peppers on Wed Nov 04, 2009 6:51 pm, edited 4 times in total. The destruction of them will slow down greatly. Enhancement chips are simply not happening. DSP/C4 can probably be quickly done with a PIC, but by the time you make the Super FX you are a significant way to doing the entire system. For the small number of games and the big increase in hardware it was a design decision early on not to do them. You mean the 96Mbit version? ~25 secs to load but boots fine. Especially when you compare it to the loading time of a PlayStation 1 game. This is good news. What I like this time is that I don't need any adapter to use on a super famicom. This could be an interesting option for snes programming in a near future since this is what I would have the most interest in such a device. For now, I will concentrate on my nes project. Is it a coincidence that it just came out before the Christmas season? Nice work. I guess my 96mbit repro board can wait a little longer. How big is the onboard sram? As far as the mappers as concerned, would I be able to write one that uses bankswitching so that I could take advantage of the full 128mbit if necessary? Enhancement chips are simply not happening. By you or anyone? XC2S30 again? This is amazing I didn't exept it to come so early !! 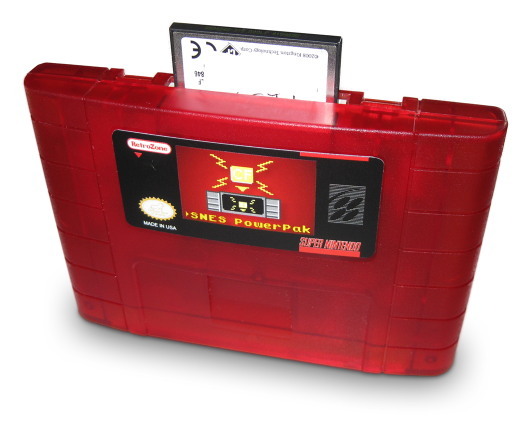 Too bad I have only a crappy 16MB CF cart that don't work with the NES power pak, can't wait until I find a better one. I am curious what is the CIC inside it ? Not that i really care as I have a CIC re-rooter I always use to play non-PAL SNES games, but I guess it wasn't reverse-engineered, was it ? The SDRAM is 128Mbit, bankswitching should be possible to use the entire thing. There is no other SRAM chip on there. Right now the mapper chops up the address range into 4Mbit sections which can be nothing/rom/ram. Block RAM is used for that so granularity could be much smaller. DSP and the 6000-7FFF SRAM are handled separately.